I have a motherboard but it not belong to the PC but machine PC which we call as controller, but the parts all are similar to ordinary computer, motherboard, RAM, hard disk, power supply unit and processor. My problem is that when i switch on the pc i did not hear any beeps without RAM, but Processor fan runs normally, Power LED on, PSU also good i check out with it. But sometime on clearing CMOS I hear 4 beeps(without RAM) and then no beeps at all, then again switch it off and then on no beeps.. Please Give some advice regarding this issue. Did you think may be it is processor or PSU issue? If yes please ask me any question regarding this and help me.. When it does show a display can you tell if it gives any information about the motherboard? Sometimes it'll show the model number. The fact it shows a display sometimes might mean a transient problem with the motherboard. 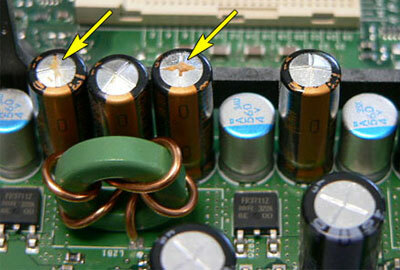 Often that's caused by bad capacitors, usually those around the cpu. If they look kind of puffy and maybe have dried residue on top indicating leakage then that might be the problem. It varies by BIOS manufacturer, but 4 beeps is most likely incompatible or bad RAM. Difficult to say for sure because you haven't posted board model or any of the components you've put on it. All you said is it's "similar" to the other computer. That tells me you don't really understand much about motherboards. Thanks for your reply, what i am trying to say is, it is not an ordinary pc, it belongs to textile machine on which the motherboard is connected in the panel board of the machine so it does not have any motherboard model, but i am quite sure it is Phoenix bios which is written on motherboard, like i said it have the power supply unit, which is ATX type and hard disk and SD-RAM(but only one slot). Hope you understand. Sorry for my quite bad English. and check the beep codes. If that's not it, well you must be able to see the motherboard since you've described part of it. The model number is almost always printed on the motherboard somewhere. In general the fact that fans and drives spin up and LEDs flash doesn't mean anything as they are powered separately from the motherboard. On an otherwise good motherboard it's normal to get beeps when you remove the ram but I can't tell from your description if you're getting the beeps with no ram or with ram sometimes installed. But another common beep error has to do with the video. If you have a video card installed (and aren't using on-board video) make sure the card is firmly seated in its slot. › Is my P5N-E SLI Dead? › Is my CPU dead!! › Is my Gateway Monitor really dead? An embedded computer, rather than a personal computer. I see that it have BEmCORE-v6335 other than that no information, also i see scbd 1481, i dont know what it was? Sorry guys this information is not enough i know this is irritating but i am confused because in voltmeter i got 24v for 12v rail, 10v for 5v rail and 6.5 v for 3.3v rail I think it is abnormal.. what you guys think about it? May be the PSU is faulty? 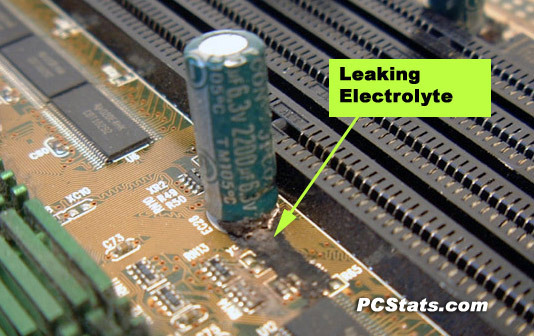 If the PSU has produced over-voltages it is possible that it has zapped the motherboard too. So the voltage readings are double what they should be? Are you sure the meter is good and you're checking the right leads? Also, if the PSU has a 115/230 voltage switch--it would be near where the AC power cord plugs in--make sure it's in the right position for your area. If it's not correct first unplug the power cord and then switch it. It is my mistake instead of selecting DC volt i select AC volt in multi meter that is the mistake, now i check it shows 3.4v, 5.2v and 12.2v this readings are ok? Yeah those voltages are OK.
Did anything happen to the computer or were any changes made to it between the last time it worked OK and the first time it didn't? Since you can see the ram stick I assume you can get to it. You might as well remove it and install a compatible different one just in case that's the problem. I doubt it's the power supply but if you have a known working compatible one available you might swap it in to see if that's the problem. You can also temporarily disconnect the hard drive and any added cards and then see if it starts up at least to a posting or logo screen. If it seems to start up then one of the disconnected items is likely at fault. No changes it behaves the same. I already disconnect Hard disk, monitor(which is touch screen), all external cables and devices, i check for beeps only with cmos battery and RAM, power supply unit and Processor. Thank you for your time and waiting for further advice. If that is the case then I need to replace the motherboard itself? "PSU also good i check out with it"
You checked voltages but that's only semi-helpful. There's no easy way to check that the PSU is capable of supplying the required amperage at those voltages. "the keyboard that connected to it is not working"
If it's USB & the board has a PS/2 port, try switching to a PS/2 keyboard. Once CMOS is cleared, USB may not work properly until the BIOS settings are reconfigured. "I even clear the cmos several time (40 to 45 times) of no use"
A board doesn't need a CMOS battery to boot up. All it's used for is to maintain voltage to the CMOS chip so that the BIOS doesn't reset each time the system is powered off. In other words, you can run a system without a CMOS battery as long as you're willing to constantly reconfigure the BIOS settings after each shut down. "sometime on clearing CMOS I hear 4 beeps(without RAM) and then no beeps at all"
Beeps codes generally indicate the board & CPU are good but as DAVEINCAPS mentioned, the board may have bad capacitors. Sometimes it's not obvious, so look closely. If you find bad ones & you're good at soldering/desoldering, you might be able swap them out & save the board. You are right i am not sure with it. I try out with PS/2 keyboard also with no use. Thanks for the links though. I try to give a close look today and post back. If i found out i try to do that. Not sure, if unable to do then I think i need replacement of motherboard. What you think? The motherboard capacitors will be soldered on both sides of the board and those are a little difficult to desolder. And of course you have to remove the motherboard to do any of that. But you only have to worry about that if you observe that they are bad. Oooh, look at all the pretty balloons. I think Q is a transistor. They can zap or fail but not usually burn. That makes me think that something else, such as a short circuit (maybe in some capacitor) is causing it. Another possibility is that it is something nearby that has burnt. Unless you are well up on these things it's new mobo time. Thanks for changing the tiltle. You're welcome. I get the impression that's an older motherboard and it might be hard to find an exact replacement (if that is necessary). I hope you can find another one. Who installed the computer and its software? Was it the manufacturer of the textile machine? I found a person who well trained in soldering things and try to get the old one and try to put a new one. Hope all will be fine. If i did this i will be very happy and i will update what happens. No it is German company named FONGS. He told me that it is difficult to change the chip alone because inside the motherboard also burnt so have to change the new motherboard! Hope you can find a replacement. Let us know how it goes. Thank you all... If i found a solution i update it. Yes, the problem with electronics is that a burn somewhere can often be caused by something elsewhere that looks perfectly normal, such as a shorted capacitor. Also one fault can result in more than one damaged component.